"How has expressing your creativity through beading enriched your life?" This sounds like a question I'd be asked to answer on an application for design school as a jewelry designer, but it is an interesting thing to think about if difficult to pinpoint. I learned to bead when I was very young from a friend of my father's and did it for a number of years and then stopped. After graduating from college I found myself in my first non-directly artistic job in the theater. I craved an artistic outlet so I started making beaded lampshades. It was a short lived return, but about three years later I decided to create some beaded Christmas ornaments as presents and rediscovered my love of beading. It was a stressful period in my life and I found that the concentration that beading took was one of the most soothing things I could do with my down time. 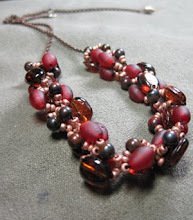 Beading allowed me to create beautiful finished products in the short periods of free time I had. Beading has continued to be a source of stress relief, and while I enjoy selling the occasional piece, that aspect has remained the most important to me. It continues to provide me with an artistic outlet that is entirely mine, based on the patterns and designs that are in my head. Unlike other aspects of my life, there is never a need for artistic compromise. I can choose to create anything so long as I have the patience for it. Allowing my artistic energy to funnel into my beadwork helps keep the rest of my life in balance.